This Opal necklace features a solid Ethiopia Wello crystal Opal with a lovely blue and green rolling flashes. 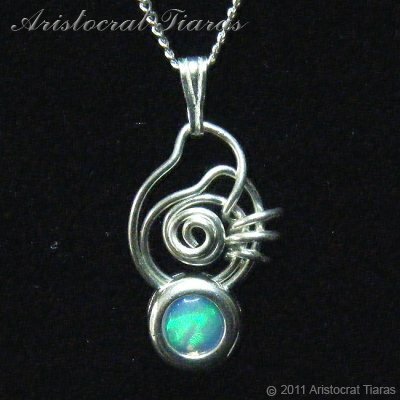 The opal is secured in a sterling-silver mount and is enhanced with a sterling silver contemporary artistic design. This handmade necklace from Aristocrat Tiaras is part of our Opal jewellery collection for one special mother of the bride or lady to enhance her outfit or makes a attractive gift for any special occasion!